Federal Mail Fraud Defense Attorneys - Oberheiden, P.C. 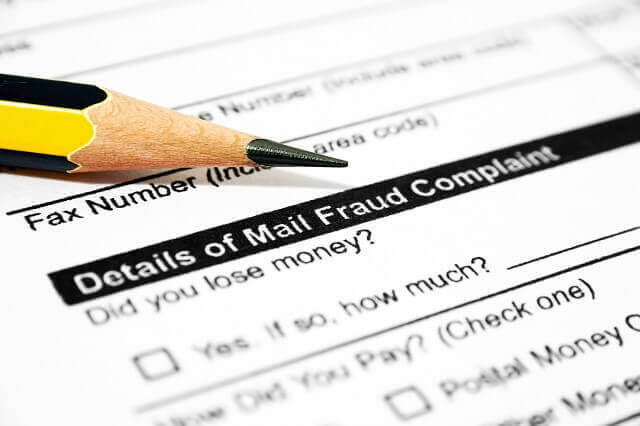 What You Should Do When You Are Under Investigation for Mail Fraud? The United States Postal Service (“USPS”) is an executive agency within the federal government that manages the country’s national mail service. The USPS is also tasked with protecting the national mail service from criminal misuse and investigating crimes that may adversely affect the mail service. The law enforcement function of the USPS is handled by the United States Postal Inspection Service (USPIS). The USPIS is among the oldest law enforcement agencies in the United States. It is charged with enforcing federal laws regarding the mail service and investigating criminal activity conducted via the postal service. The USPIS is overseen by the United States Postal Service Office of the Inspector General (OIG), which operates independent of the USPS. The OIG additionally manages the prevention, detection, and investigation of fraudulent or criminal activity within the internal operations of the USPS. Typical OIG enforcement activities include investigations into contract fraud, financial fraud, internal mail theft, official misconduct, and healthcare fraud. By the time you discover that you are under investigation for mail fraud, the investigation will most likely have been ongoing for several months or even years. Federal investigators – in the case of mail fraud, United States Postal Inspectors – are not obligated to inform the targets of their investigations about the investigations when the investigations are first initiated. Often targets first learn of the existence of an investigation when U.S. Postal Inspectors approach them for an interview as a “witness” to the investigation. As a rule of thumb, if you are approached by investigators and you are not the victim of a crime, you should assume that you are a target of their investigation, regardless of what the investigators may tell you at the time of the interview. Other ways targets may learn of an investigation include receiving a “Target Letter” – a letter from federal prosecutors alerting a person that they are under investigation for mail fraud and inviting the target to cooperate with the investigation, receiving a grand jury subpoena, or having a search warrant executed at the target’s home or office. Knowing and asserting your constitutional rights at all times during an investigation for mail fraud is an important way to protect yourself from self-incrimination and from unwittingly helping the U.S. Postal Inspector’s case against you. Right to Remain Silent. Unless and until you are subpoenaed to testify in court, you have the right to refuse to speak with investigators. Asserting your right to remain silent cannot be used against you later in court. However, even while you are asserting your right to remain silent, you still need to confirm your legal name and address to investigators if they approach you. Right Against Unlawful Search or Seizure. Unless and until you are presented with a valid search warrant, you have the right to refuse to have your home or office searched. If investigators approach your home or office, you may confirm your identity and then politely decline any requests to search the premises. Right to an Attorney. Whether or not you have been officially charged or named as a target of an investigation, you have the right to legal counsel. You also have the right to refuse to speak with investigators outside of the presence of your legal counsel. Notably, while you have the right to hire your own lawyer, your right to have a court appointed attorney – such as a public defender – does not apply until you have been legally charged with a crime. It is important to keep in mind that your constitutional rights may be waived if you do not assert them. For example, if you voluntarily allow investigators from the U.S. Postal Inspector’s office to conduct a warrantless search of your home, you cannot later complain that the search violated your constitutional rights. Do Not Communicate About Your Case. You should avoid sharing the details of your case with anyone other than your attorney. While your attorney has a legal right to keep your information private, your friends, family members, and co-workers may be ordered to testify against you regarding any information you share with them. Similarly, the government may – and often does – subpoena records of your communications, such as your emails, text messages, and phone records, to use as evidence in court. Thus, any information you share electronically may be revealed to investigators and used against you. The best way to protect yourself from unwittingly giving investigators details about your case is to stay tight lipped. Do Not Post About Your Case Online. Government attorneys may also subpoena records of your online activity, including social media platforms such as Facebook, Twitter, Reddit, Snapchat or Instagram. Any communications, including private messages as well as public posts, may be used as evidence against you in court. Similarly, records of posts in online forums – even forums where you may be seeking legal advice – are subject to government subpoena. The subpoena may be issued to you or the online service you post through. The bottom line is any information about your case that you communicate online is at risk for becoming evidence against you in the investigation or in court. Do Not Destroy Any Evidence. While deleting incriminating documents may seem like it will help your defense, the reality is the opposite. Prosecutors will likely see any destruction of paper or electronic files and any destruction of devices that contain files as obstruction of justice, which is a criminal offense punishable by up to five years in prison. In fact, prosecutors often rely on obstruction of justice charges to force plea deals or obtain convictions when their underlying cases are weak. Therefore, if you destroy documents in order to protect yourself in a kickback investigation, you will likely hand the prosecutors an easy conviction for obstruction of justice. Don’t Wait! The minute you suspect that you are under investigation for mail fraud, you should obtain legal counsel. Defense attorneys do not just represent clients in court, they also guide clients through the investigative process with an eye toward minimizing or avoiding any potential charges. The sooner you hire a defense attorney, the more likely you will be to optimize the outcome of the investigation in your favor. The Right Attorney. Hiring the right attorney is also key. If you are under investigation for mail fraud, your case is being handled in the federal court system as opposed to the state court system. You want an attorney who is well-versed in the federal rules and procedures and who is familiar the local federal judges and prosecutors. Notably, federal judges and prosecutors tend to have superior education and experience than their state counterparts, and you want a defense attorney who knows what to expect in federal court and has a comparable pedigree. If you are under investigation for mail fraud, call the former federal prosecutors and veteran defenses attorneys at Oberheiden, P.C. today for a free and confidential consultation. Oberheiden, P.C. is experienced at defending individuals and businesses facing federal criminal investigations or charges. Our attorneys are standing by seven days a week – including weekends – to speak with you about how we may be able to assist you with your investigation.